Support social-emotional learning in your classrooms with resources that develop communication and understanding, and foster thoughtful conversations about feelings, friends, family, and more. 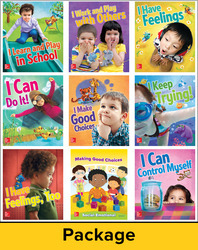 Each set of eight colorful 13” x 15” big books is perfect for read-alouds, with three stories per book that focus on relatable topics for learners ages 3-6. The full-color 16” x 20” spiral-bound flipchart provides engaging visuals and ideas for purposeful play. Read more about social-emotional learning on our blog.